Every once in while you come across a business that feels so genuine and good that you can’t help but want to support them. 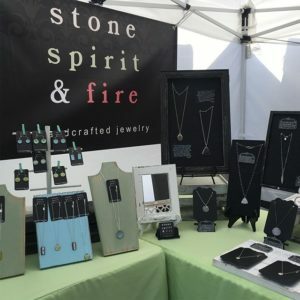 Stone, Spirit, & Fire is one of those small businesses. 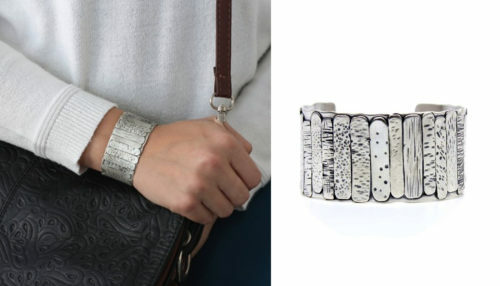 When Metalwerx studiomate Kelly Bollman started Stone Spirit & Fire, she knew she wanted her jewelry business to be ethically sourced, environmentally friendly, and give back to organizations that are making a difference in the world. Her journey to building a more sustainable and impactful practice started with her materials. 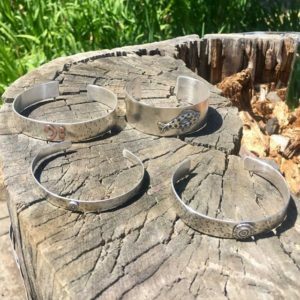 By becoming a member of the Ethical Metalsmiths, she became better informed, and is now able to choose metal and stones that are mined in an ethical manner. Then she picked packaging and shipping options that are 100% recycled and UPS Carbon Neutral. Most remarkable of all was her decision to donate 10% of every sale to an organization she believed in. Each month she picks an organization to donate to, and in the past year she has donated 10% of her profits to Find the Cause Breast Cancer Foundation, American Humane, Great Dog Rescue New England, RAICES, Social Catalysts Charitable Foundation, Ethical Metalsmtihs, and The Lalla Project. This month she is donating to Metalwerx! Kelly began her love affair with jewelry in 2000, when she found herself captivated in the bead aisle of her local craft store. What began as a harmless hobby making jewelry for her and a few friends, catapulted into a bustling business in the early 2000s. Kelly was hooked, but her kids were growing up fast, and she decided to put her career on pause while her little ones were in school. With her youngest off to college she was ready to restart her business, but this time around she knew she wanted to learn how to work with metal. As luck would have it, she met Metalwerx studiomate Peg Hoddinott in 2013 through a mutual friend at a concert. Peg told Kelly all about Metalwerx, and in 2013 Kelly took her first class with Diane Lawton. Kelly embarked on a rigorous class schedule, learning from some of best local and national jewelers. By 2014 Kelly was ready to launch her new business and Stone, Spirit, and Fire was born. 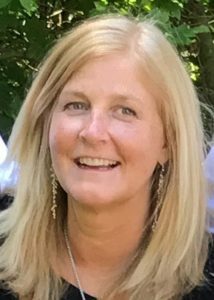 In 2016 Kelly joined our Studiomate community as a full time bench renter, after downsizing to an apartment which would not allow for her to use an acetylene tank and torch in her home. You can usually find Kelly in the Metalwerx studio on any given day of the week, undoubtedly wielding a hammer, or shaping a cuff bracelet. Hammer marks are a signature look in Kelly’s work, as Kelly says “It is without a doubt hammers are my favorite tool! I love all the different hammers I can use to create textures, forge and fold form”. As the daughter of commercial fisherman and a sailor in the Navy, it feels as though this attraction to beach pebbles, soft sand, and crashing waves was somehow inherited. Kelly says “I love everything about the beach, the sand, the salt air, watching the waves, swimming in the ocean, fishing, boating, sunny days, stormy days, and long walks in the sand”. Although it is not always her intention she often finds herself seeing textures and designs in her jewelry that reminds her of the ocean. Kelly is excited about her newest series “Board walk”, which beautifully combines forged silver and dynamic hammer textures which create an abstract representation of the beach. This holiday season shop handmade with Stone Spirit and Fire, and help support Metalwerx by doing so! 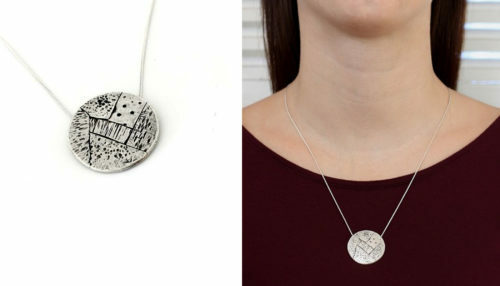 10% of every purchase will be donated to Metalwerx in the month of December. You will find great gift ideas for this holiday season with the added benefit of giving back. Plus she’s extending her generosity even further – you will also receive a 10% discount! 1) Attend a Stone, Spirit & Fire show and be sure mention Metalwerx to get your 10% discount. Click here for a show schedule. Locations include Natick and Marblehead. 2) Order online and use coupon code METALWERX10 to get your 10% discount. Offer valid December 1-31, 2018. Next post: Thank you for an amazing 2018 at Metalwerx!